I’m just going to come out and say it: Jackets are the best thing about spring. That’s, as the kids say, #facts. It’s not debatable, and I’ll tell you why. Spring weather? It’s just okay. March Madness? Fun, but ultimately (usually) heartbreaking. Putting on a great, well-fitting lightweight jacket over any spring outfit, though? Well that’s guaranteed to make you look Gosling-level handsome with just one layer—and make any mediocre weather day more pleasant. Will it help your team win? Unless it’s Duke, honestly probably not. But still! For those days when warmth and sunshine are just starting to come out and flirt, you want a top layer that can be anything and your everything, you know? It’s gotta be versatile enough to work at Saturday brunch all the way through an afternoon park hang and followed by crying into a basket of wings when your bracket gets ever more busted later that night. And, it should be just the right weight and warmth to keep your internal temp regulated in the bar and outside waiting for your Uber home. In a perfect world, I’d show up at each and every one of your doorsteps and personally outfit you in a nice, lightweight bomber jacket this spring. Yes, I’d hold it out encouragingly and have you slip each of your arms into those knit-trimmed sleeves one at a time, while telling you that you’ll never own a more handsome, goes-with-everything jacket than this. So just imagine me doing that while you click “add to cart,” okay? Back in the fall, I wrote a long, rather gushing ode to the military field jacket. Well guess what, I’m not over it! I’ve got spring fever, and the only cure is more extremely versatile, casual outerwear. J.Crew’s cotton field mechanic jacket even has a hidden hood, in case you get caught in some of those April showers. Normally Team SG would not endorse dropping this kind of coin on a track jacket, I swear. But this Nike one—part of a collaboration with designer Martine Rose—pulled us all in with its retro vibes and ultra-wearable navy-green-cream color blocking. If you’re feeling sassy, spring for the matching pants, too. 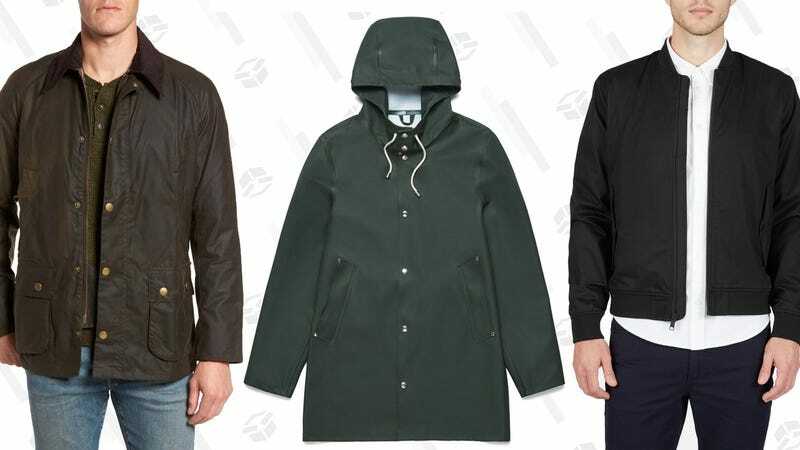 Apparently the Scandinavians know a thing or two about looking good in bad weather—their raincoats are incredible. This jacket is made from 100% PVC and was inspired by an old fisherman’s coat the founder discovered in his grandfather’s barn. And if that isn’t the most Scandinavian origin story you’ve ever heard, then I’m a Swedish fish. Maybe it’s because Vampire Weekend finally has a new album coming out in May. Maybe it’s because the smell of waxed canvas reminds every woman of her father. But listen, I am all about a Barbour jacket right now. Throw one on over your new lavender duds this season, queue up “Harmony Hall,” and lean into the preppy vibes. And finally, because I can’t ever help myself, I want to talk to you guys a little bit about the gorgeous, ruggedly sophisticated suede jacket from Schott NYC. If you haven’t already spent your tax return on a second leather jacket, I really, really want you to spend it on this. I know it’s a splurge, but by the time you pass the jacket on to your son, and he passes it on to his son, the cost-per-wear will be like, $0!